Heaven Saphir is one of the best boats in the Egyptian part of the Red Sea. We have served European market for more than 12 years with exceptional history of success. 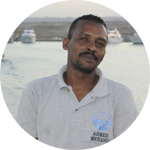 With the competition of over 300 safari boats in the Red Sea, we have lots of happy, returning customers. Heaven Saphir is a 36m boat with 9 roomy cabins for up to 19 divers. Two of our cabins are honeymoon suites, one is an executive suite that can host 3 guests. Each cabin is equipped with toilet, shower, air conditioning. 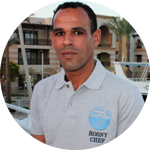 Our perfectly trained crew will clean your room daily while you are diving with no inconvenience for you. The saloon is big and cozy with an LCD screen for watching movies and your underwater footage. All our meals are European cousin with a slight touch of Middle East. We have an exceptional chef in our crew that cooks anything from fish or BBQ meats to fresh bread and delicious deserts; we offer you unlimited water, snacks, high brand coffee and tea throughout your trip on board of Heaven Saphir, free of charge. You will find a variety of sodas, beers and vines in our saloon bar for additional charge. Between the dives you can enjoy the hot Egyptian sun on the sundeck, or you can hang out there in the evening with a drink, watching stars and listening to the sea. MV Heaven Saphir is equipped with 2 high pressure compressors and a membrane Nitrox compressor. We check the gases every time we mix them and we insist that you double check your mix as well. All our equipment is safe, is kept in good order and ready for your scuba dives. Our professional mechanic is capable of solving most of the problems that can happen with your scuba gear at sea. 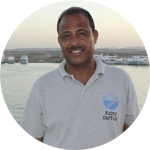 Our trips are mostly done in the southern part of the Egyptian Red Sea, where the water is the utmost pristine, corals are alive and colorful, fish is plenty and sharks are the regular visitors. You will enjoy diving there with your camera. And we have a large tank to rinse your underwater photo/video gear in the fresh water after each dive. If needed, our dive guides will help you with a choice of lens for a particular dive. We know very well the needs of underwater photographers. In other words, MV Heaven Saphir is owned and managed by Europeans. You can expect European level of service for Egyptian level of price. We are the divers who serve the divers. We’ve been there; we know what you need, we can meet your expectations. All technical specs of MV heaven Saphir are covered here.